Mark and Paul Hayward have sown 33 hectares, the equivalent of 83 football pitches, of nectar rich plants around their Dingley Dell Pork site and arable land. 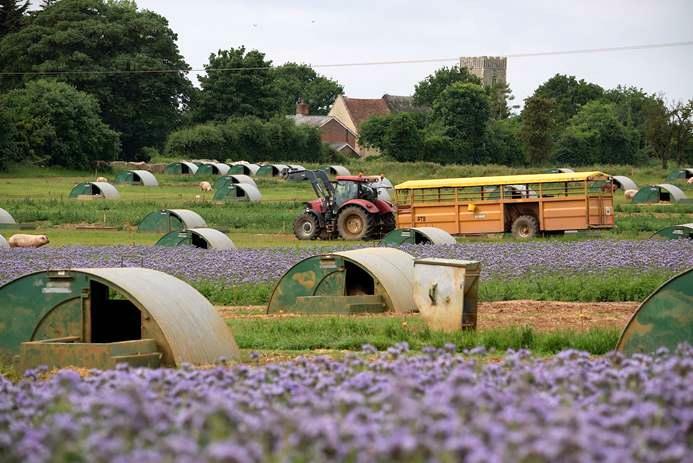 The wild flower mixes, which includes Phacelia, Clover and Mallow, are planted in blocks between the rows of pig arcs and in the fields. A trial last year showed up to 12 bumblebees could be seen feeding in each square metre of the wild flowers. The brothers are now confident they can reach their "one million bees" target. Paul Hayward said modern life has pushed nature to the fringes. "Farmers can help restore this balance starting with a diversity of plants," he said. "If you have this diversity the bumblebees and other insects, then birds and mammals, will follow." The United Nations has declared this coming Sunday (20 May) World Bee Day, which aims to highlight the importance of them and how their numbers are threatened. It's estimated that around a third of the world's food is dependent on bees and other pollinators. According to the Bumblebee Conservation Trust, many types of bumblebee in the UK have seen their populations decline by 70 per cent, and 2 species have become extinct in the last century.